A DECADE passes with the blink of an eye … or so it seems. “Sent Forth by God’s Blessing” was the herald for the evening’s celebration of the Methodist School of Music’s 10th anniversary on Feb 3, 2007. The Gala Dinner held at Raffles Town Club was graced by Bishop Dr and Mrs Robert Solomon and attended by about 500 guests, supporters and staff members. The evening’s programme was planned by the MSM faculty and staff in thanksgiving and acknowledgement of God’s faithfulness and grace for the decade since the founding of the school. 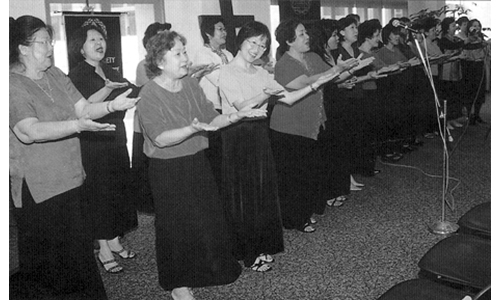 The MSM was conceptualised in November 1995 and was officially dedicated to God on Jan 25, 1997. Its humble beginnings were at John Wesley Centre (the former Methodist Girls’ School premises) where two classrooms were converted to house the school office and music studios. 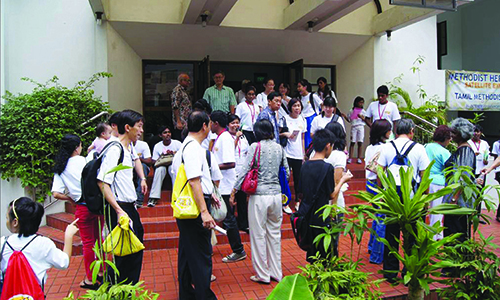 Music lessons started almost immediately with 18 students, mainly from the Praise Choristers of Telok Ayer Chinese Methodist Church. In September 1997 the MSM was officially registered with the Ministry of Education as a private school and in July 2002, it attained the status of public examination centre for the Associated Board of the Royal Schools of Music. Student enrolment and the number of teaching staff number increased over the years. The school currently has about 400 students and 40 teaching and administrative staff. With the aid of a PowerPoint presentation, the Principal, Ms Mary Gan, recounted the milestones of the school. Despite teething pains, various challenges and obstacles, God’s hand was apparent from the beginning. 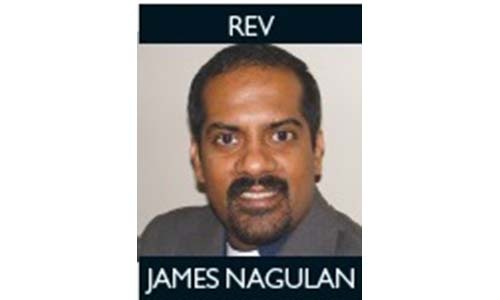 His grace carried the school towards fulfilling its purposes of music education and ministry. Annual “Church Music Encounters” provide modules on music ministry training, musical concerts encourage both teachers and students to hone their performance edge and gain exposure, and visiting musicians and lecturers provide special insights into music and ministry. Now in its second phase, the MSM is in partnership with Trinity Theological College and offers the Master of Theological Studies (MTS) degree programme, which is aimed at equipping and educating music ministry personnel. The MSM has also recently embarked on an educational outreach ministry to the Boys’ Brigade in Siem Reap (Cambodia), teaching music to the local children. At the dinner, hymns were sung, accompanied by strings, trombone, keyboard and handchimes. The alumni of the Praise Choristers rendered two lovely musical items. The staff of the MSM also sang an arrangement of “Grace Alone”. Bishop Dr Solomon and Mrs Solomon presented Long Service Awards to the administrative and teaching staff, and special recognition awards to students who obtained high scores in music examinations. It was an evening of good cheer, of celebration and gratitude, and a time of rekindling friendships and acquaintances. 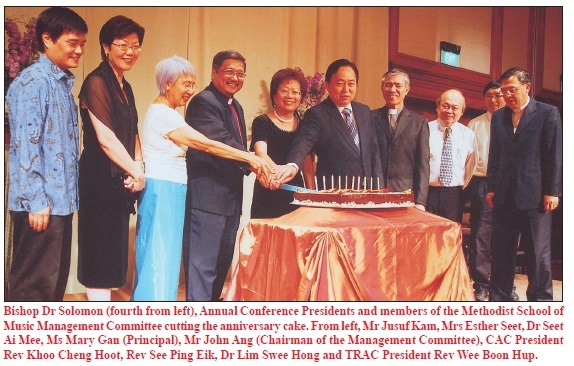 The MSM would not have come thus far without the support of The Methodist Church in Singapore and the three Annual Conferences, both in their financial giving and prayer. May God’s grace and presence continue to abound in the MSM as it strives to fulfil its calling to be a blessing and beacon for music and ministry, both within our shores, and beyond! 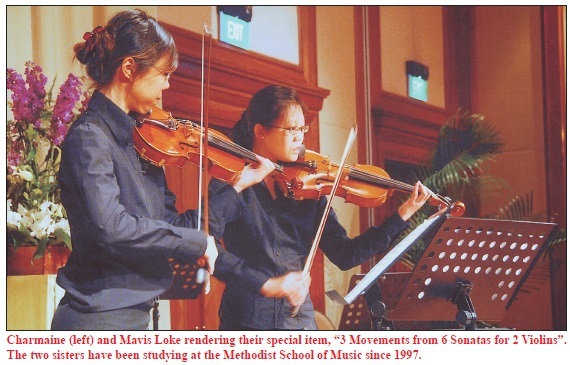 Dr Evelyn Lim is lecturer/organist at the Methodist School of Music.